RIFT news tidbits for 29th March 2015. Main topic today is additional information to Friday’s Livestream relating to Return to Hammerknell. I’ve added a bit of additional information to Friday’s Livestream Summary, mainly to do with the upcoming Tier 2 raid. Full info and screenshots of the Livestream Summary can be found here. The upcoming Tier 2 20-man raid is officially called “Return to Hammerknell”. Trash mobs have a chance of dropping unique gear for slot/s that you can’t get anywhere else for Tier 2. Some bosses will have old mechanics whilst others will have new mechanics that build on the theme of their old mechanics. The Return to Hammerknell raid will be one instance lock-out. 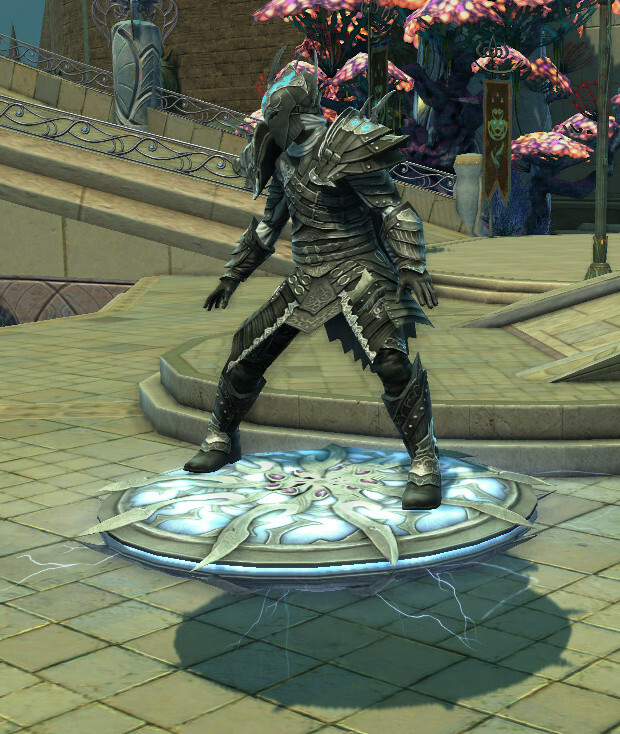 Unsure if there are new models for gear, but the model Anony showed was a model for Nightmare Tide Crafted gear. Bosses drop 400-450 Fragments of Madness, a new currency. According to system messages in the livestream, the weekly cap is 5,400 Fragments of Madness. Old HK achievements will become Legacy. This means you will not be able to obtain the Swift Armored Murdantix Bridle or the “Tide Mistress”/”Tide Master” title after 3.2 hits. If you’re a mount collector, you might want to consider finishing off those few achievements you still have to do prior to 3.2. Old HK achievements are currently found under Achievements (default key “h” -> Raids -> RIFT -> Hammerknell Fortress). Trion could make them available elsewhere, but there’s been no indication of this. The new HK achieves for 65 have a new title “The Beast” and mount “Storm Legion Lifter Mount“. (The mount could be placeholder, since the Storm Legion Lifter Mount is an existing mount available during Arclight Infiltration Promo Week). Some boss mechanics were briefly talked about. Vladmal Prime has changed a lot. Adds will come in about 30secs into the fight. There are two different lights at the bottom of the encounter. Adds will spawn with shields that make them invulnerable – you must bring them to the correct light. Taking them to the wrong light will have consequences. An exchange between Epsiry and Anony seems to suggest that you either need 2 or 4 tanks for this fight. Vladmal Prime seems to enrage if you take him down to the bottom of the encounter so you can’t just have the raid fight him near the lights. Estrode seems to have changed a bit. Similar theme with Estrode still gaining abilities based on which soul buffs she has. Quadrants of the encounter room will turn red – likely doing damage if you are in them. There’s a ton of neutral ‘Lost [Soul]’ wisps all over the place with each Class’s souls (i.e. ‘Lost Sentinel’). Unknown what the exact mechanic for these wisps are. Inquisitor Garau is now significantly harder because the golems will activate one by one. You can no longer prevent golems from activating. You must kill all three golems before Inquisitor Garau can be killed. Akylios will be the original Level 50 Akylios, pre-nerfs, scaled up to 65. 20min fight. Hit Debuff is still present called ‘Voice of Madness’ which decreases your Hit by 120. You’ll notice the Trinket at the bottom doesn’t have any stats. However, it’s name is “Canticle of” and doesn’t have a suffix. Chances are multiple (if not all Classes) will get their own version of this Trinket, with “Canticle of” describing the proc, and the suffix relating to the stats it will have. 5-man Conquest Premade Limit. Anony stated “I believe that was actually implemented successfully by Ruffles”. This seems to suggest that the experiment Trion wants to do with limiting Conquest Premade sizes to 5 players will appear ‘soon’. New Gear Appearances for HK. Vladd mentioned in the chat channel that HK gear will have a new appearance, although Anony’s helm drop looked like NT crafted gear appearance (unsure if that’s what Vladd meant by ‘new’). Inconsistent Dyes. Archonix will check with Marigold on the Butler’s Bundle’s dyed color. Sun Dresses. Not sure if it was a joke, but Archonix mentioned Trion was working on letting male Bahmi’s wear Sun Dresses. You can find further information on the upcoming 3.2 Wardrobe System, Return to Hammerknell Tier 2 20-man Raid and visible Elo Rating for PvPers here. Meduza ft. Hostileapostle – Pyro Mage PvP [Video][PvP]. Check out Meduza’s latest Mage PvP video fighting players in Conquest: Steppes of Infinity here! Problem Solving [Dimension]. Feendish takes a look at how dimensioneers tackle the limits of the tools they have to work with – item limits, dimension space and even inventory space. Check it out here!